Good vegetarian dishes are always on my list to find new recipes and try them out. 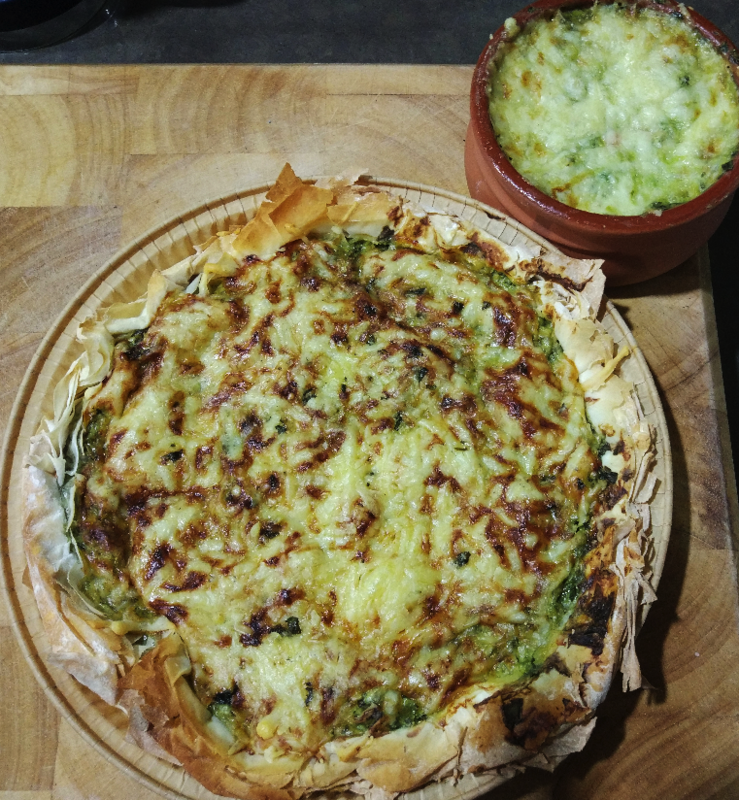 This leafy green and cheese pie from Le Manager De Paris looks like it’ll fit the bill perfectly! Pastry for a 20 cm pie. Put the ricotta cheese in a bowl. If it’s not smooth out of the tub, stir with a wooden spoon until it is smooth. Finely chop all herbs and add to the cheese. Add the grated tasty cheese into the bowl. To the beaten eggs, add all the spices and whisk together. Add to the cheese and herb mix. Place the mixture in the pie and add the grated parmesan on top until it makes a lid of sorts. I allowed the pie to cool as I’m taste testing it as a room temperature snack. Many positive things were said about it, so I’m adding this one to the St Ives list. It’ll be used as a filling mid-morning snack. I had made an earlier testing pie with cottage cheese instead of riccotta. Taste testers tried it hot, said it was okay but would have preferred ricotta cheese. At room temperature, the lighter ricotta was favoured. I note that the medieval kitchen -recipes from France and Italy (my review of this book can be found here) has a slightly different translation to the free online translation available at the above website which I’ve used and notes fennel instead of turnip tops. I’ve chosen to just leave that out. 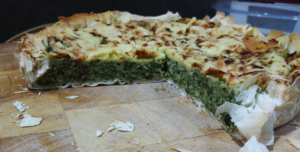 The first pie did use fennel, and I found the taste to be a little weird. I have also now tried using a 250g of frozen spinach in the goal of reducing workload. Following the instructions to gently microwave it back to temperature and then gently squeezing out excess water with paper towel, it resulted in a slightly less flavourful pie, not otherwise very similar for a fraction of the effort and price.